Explanation: Was there ever another comet like ISON? Although no two comets are exactly alike, one that appears to have had notable similarities was Comet Kirch, the Great Comet of 1680. Like approaching Comet ISON, Comet Kirch was a bright sungrazer, making a very close approach to the surface of the Sun. Neither comet, coincidently, is a member of the most common group of sungrazers -- the Kreutz group -- populated by remnants of a comet that disintegrated near the Sun hundreds of years ago. 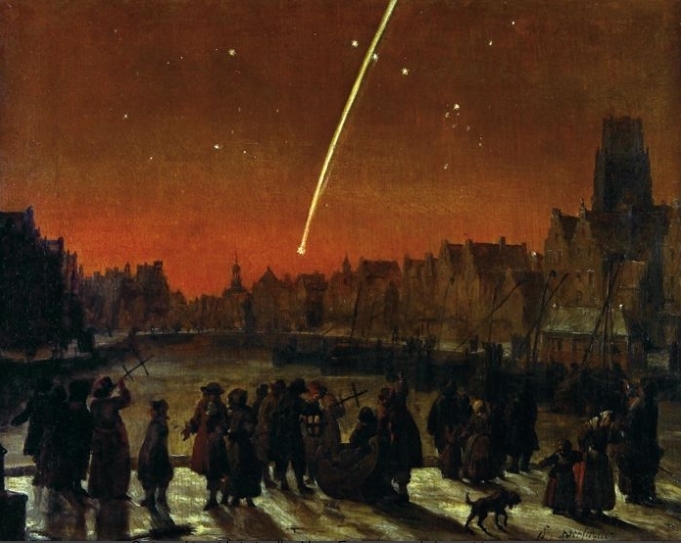 The long tail of Comet Kirch is depicted in the above painting by Lieve Versheier. As pictured, some members of the foreground crowd of Rotterdam in the Netherlands are holding cross-staffs, an angle measuring device that predated the sextant. No one knows how Comet ISON will develop, but like Comet Kirch, it is expected to be brightest when very near the Sun, in ISON's case during last few days of November.